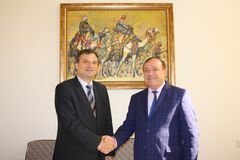 Mr. Mircea Ciopraga welcomed His Excellency and informed him about the latest activities of the Permanent Secretariat of the Intergovernmental Commission TRACECA. Mr. Ciopraga stressed the importance of essential support of every TRACECA member state regarding initiatives and suggestions on further development within realization of the Action Plan for implementation of the Strategy of the IGC TRACECA for the period 2016-2026 elaborated on the basis of the Master Plan TRACECA and proposals of the Parties for 2017-2020. The special attraction of the meeting was focused on the issues of the multimodal transport, the implementation of multilateral «TRACECA permits» and the benefits of the investment opportunities in the TRACECA region. The Republic of Bulgaria, as the member-country of the IGC TRACECA since signing of the Basic Multilateral Agreement (MLA) and as EU member-country, makes important contributions to the development of the international transport corridor Europe-the Caucasus-Asia. At the end of the meeting Secretary General of the Permanent Secretariat of the Intergovernmental Commission TRACECA and His Excellency, Ambassador Extraordinary and Plenipotentiary of the Republic of Bulgaria express their hope for the further fruitful cooperation.